After spending 2 weeks in Vietnam with temperatures in the high 30s (celcius) we arrived home to snow on the mountains and a cool fresh breeze. We had a fabulous adventure and thoroughly enjoyed the experience of learning about a different culture. There are over 5 million motorcycles in Ho Chi Min City ridden mostly by young people beeping and buzzing about the narroow streeets. Our tour took us from Ho Chi Min City up the coast by overnight train to Hoi An, (which we loved), Hue, then flew onto busy Hanoi and peaceful Halong Bay. This was the 1st time we had actually booked a tour with a group and it was great. We enjoyed the company of the other 7 fellow travellers and our entertaining guide. Back to the challenge.......surprise! I am thrilled that my brayd has been chosen by Laura's linky machine for this week. It is such a treat to see everyone's fabulous creations. Some of my favourite Vietnam pics..
All day, every day traffic! Your tile is awesome, as usual! I love the picture with the tree! My kids at school have to see these! How fun that you had such an adventure! Brayd was an adventure for me...your flowing pen is so gorgeous....maybe someday I will manage to exemplify yours! You made a beautifil challenge! 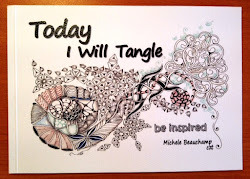 And thank you for this tangle, which I never tried before. Beautiful, beautiful...always a treat to see your work! And great pics from your trip! Glad you had such a wonderful time! Poppie, it is an official tangle called tripoli, one of my favourites. Love your Brayd ZIA, of course! 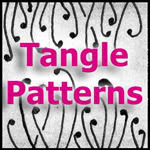 What a wonderful tangle to bring to we "Zentangle Zealots!" Vietnam looks fantastic, thanks for sharing your photos. As usual ... HAVE A FANTASTIC TILE! 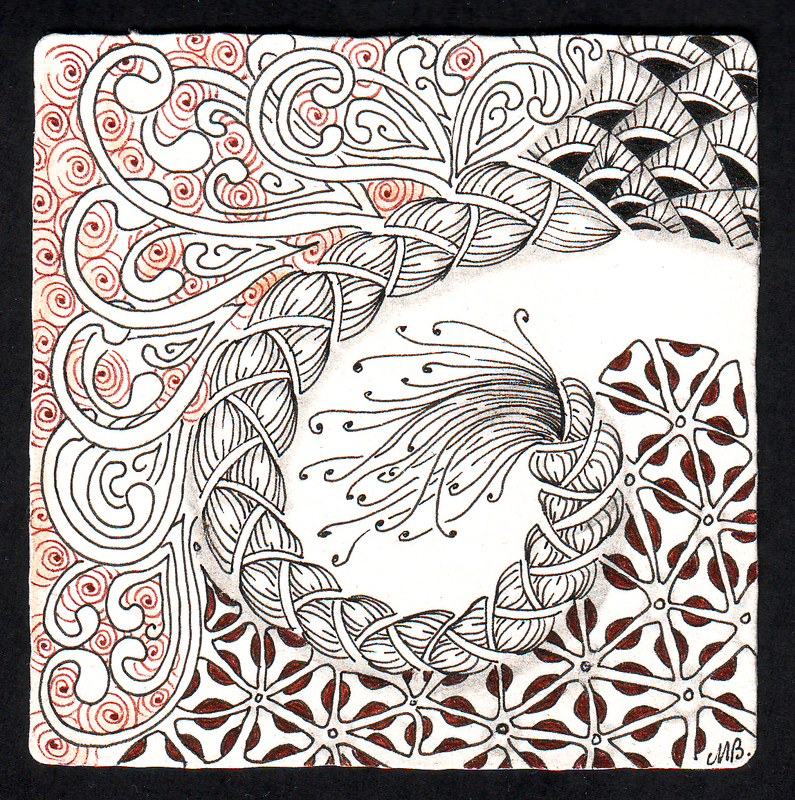 Your tile is gorgeous, and your tangle "Brayd" is one of my favorites to draw. I think it goes together so well, and I'm partial to tangles that don't require a grid. Thanks too for sharing the pictures from Viet Nam. I've never seen so many motor bikes in one place before. Wow! And love the one with the tree tied on the back. Your ZIA is awesome! Thanks for creating the Tangle "Brayd." It is fun to draw and can be used in so many ways. Your pictures of the trip to Viet Nam are great. Enjoyed looking at them. Love your tile. The touches of red really set if off. Your work is always amazing. Thanks for sharing the photos. Looks like it was a wonderful vacation. Your tile is so beautifully done. The pictures are wonderful. I am glad you enjoyed your trip, even though is was hot. I am in Illinois and it seems the whole middle of the country is super hot this year, so enjoy your snow! Thank you for sharing your Brayd. I had never done it before. I got the first section I did wrong, but all in all it turned out okay. I enjoyed doing it. oh my, what a wonderful trip you had! i love the tree on the motorbike and the fruit market - good Lord, i'd be there all day! It's so much fun to view your work...and read your posts! Your Brayd tile is, as usual, so beautifully done. How very nice to travel with a group/tour and have so much fun in another country. Photos are very nice... especially the 'home delivery'! I will get your tangle right....because I really like it! Love teh way you've done your tile and your beautiful photos. Your tile is superb Shelley, and Brayd is a lovely tangle to use. I also loved seeing your pictures of Vietnam as we were there in February. We also went to Halong Bay and Ho Chi Min City. We could of done with longer there but maybe another time. Such gorgeous, colorful photos! Vietnam looks like a beautiful and fascinating place. That tree is awesome! I want one! 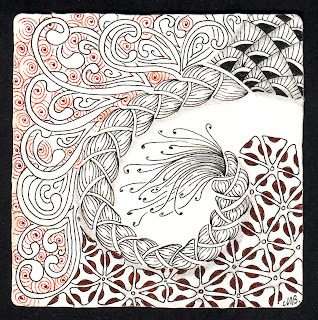 Your zentangle is curvaceous and very elegant. Just lovely!